Everyone wanted to know what we would eat when the year was over. We didn’t really know how to answer that question, or what to expect. The only way you can do something like what we’ve done is to give up on the alternative and stay singularly focused on the day and the meal directly in front of you. Instead of thinking about what we couldn’t have, we directed all of our energy on what we could discover, create, and improvise. This was necessary for survival, and also for joy and creativity. So, I began this year with a fridge and pantry stuffed with local food, and I could have easily glided into another week, month, or year with the same modus operandi. Not only that, but I have actually found it difficult to transition away from our food routine – which I didn’t exactly expect. The rhythm of living and eating this way has been grounding, cozy, and private, and I am emerging from it with a sense of being an alien from another food planet. During my first trip to the grocery store, I got so overwhelmed that I left without buying anything. I don’t love to cook – I love to eat. But, now I find a profound comfort in preparing food for myself. That said, I also have a lot of other things that I want and need to do in life, and look forward to having more time for life outside of food, once I adjust. As it turns out, most of what I’ve eaten in the first few days of 2014 is basically what I was eating last week, with a few additions. 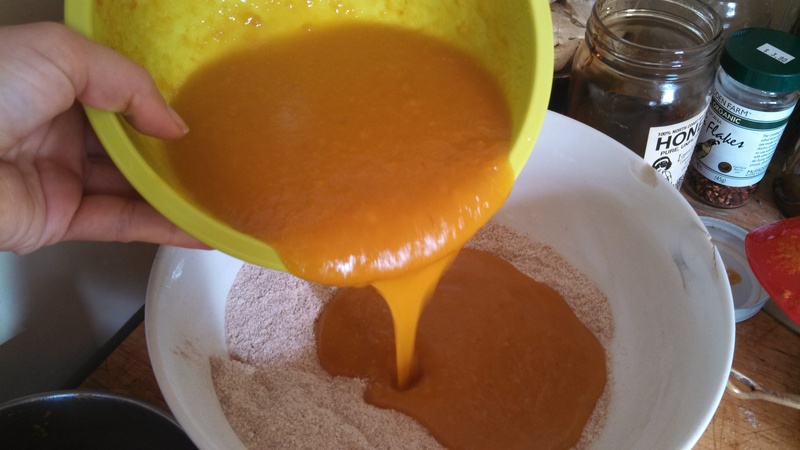 Like bubbles in my water, and cinnamon and leavening agents in my baking. 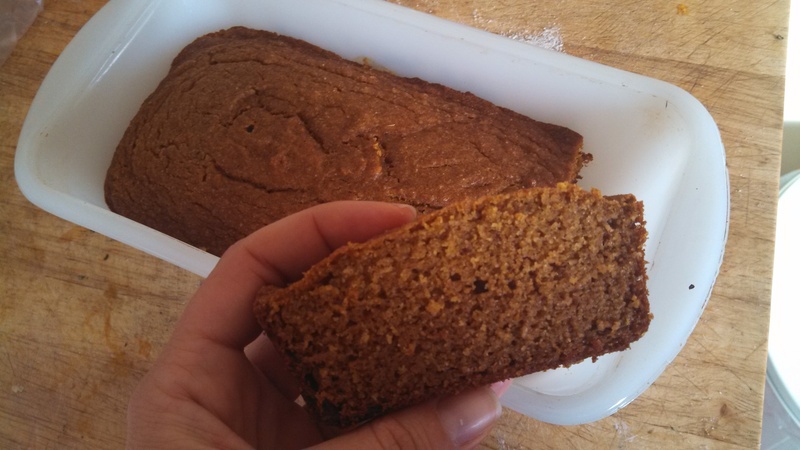 Today I baked pumpkin bread, and it was not totally gross at all! That’s because I uncharacteristically used a recipe this time. When I realized we could use baking powder & soda again, I excitedly texted my mom and asked for her pumpkin bread recipe, ASAP. I guess it was on my mind since ’tis the season and I had to watch everyone else eat loaves of it during Christmas. Of course, I still improvised a few things and used mostly local ingredients, but it was a baking success! One of the hallmarks of mom’s recipe is that the bread is super moist and yummy. I think you’ll love it. I got the pumpkin for this one from Adam and Paula Gaska at Mendocino Organics in Redwood Valley. 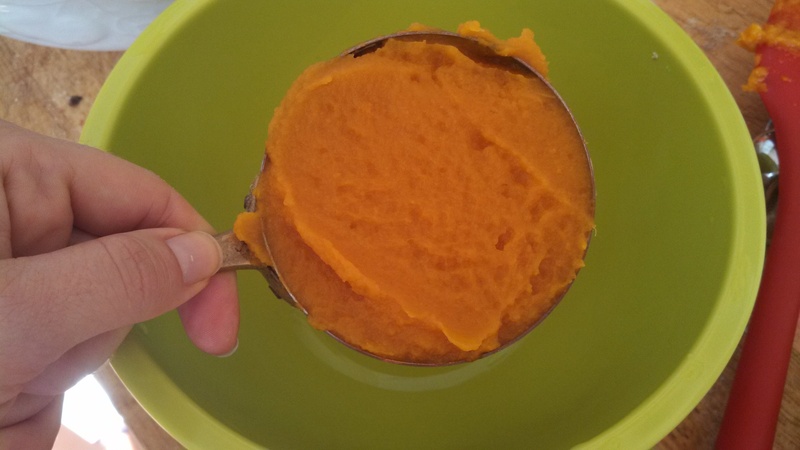 I roasted it and then pureed the pulp in the Vitamix to get the right consistency (sometimes you need to strain it if it’s super juicy). A tip on winter squash: Most farmers are sitting on more squash than they can store right now, and are feeding it to the pigs. If you want a good deal on winter squash, approach a farmer about purchasing larger quantities directly from them. You will get a much better price than at the store or the Farmers’ Market. I have never sifted anything, ever, so I asked mom if I had to and she said she always sifts, and I didn’t want to be the one to make this recipe look bad. 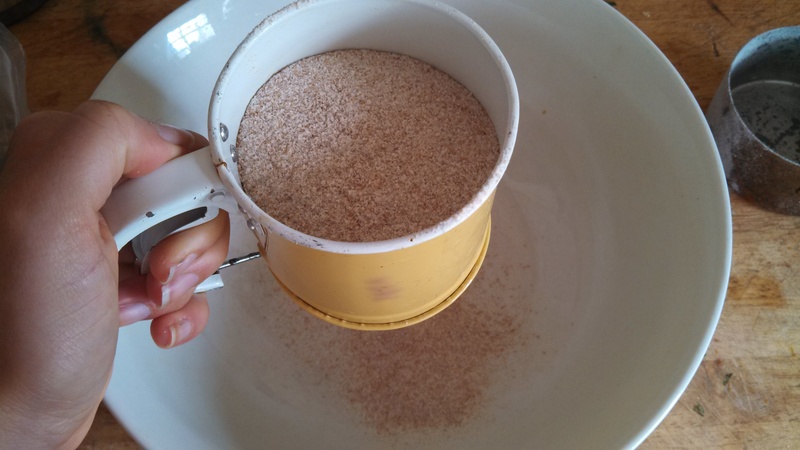 I remembered I had bought a tiny vintage sifter at a thrift store because I thought it was cute, so I excavated my kitchen to find it. 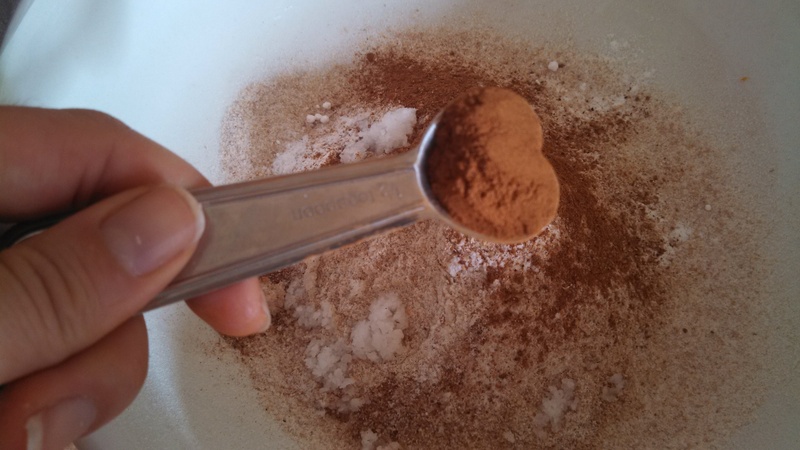 I find following a recipe more tolerable when using heart-shaped measuring spoons. I think Mom got me these, too. Beat all other ingredients in a separate bowl and then add all together. Honey trick: I heated up the coconut oil and then stirred the honey into that to make them both easier to mix in. Bake at 350 degrees for approximately 40 minutes. Enjoy! 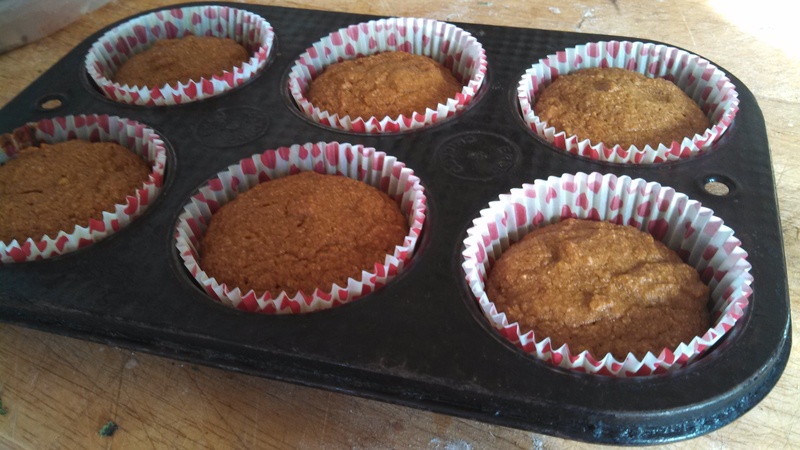 Since I don’t know anything about baking with leavening agents, I didn’t want to overfill the bread pan, so I also made some little cupcakes, and then froze most of them for a rainy day (a smart thing that I never do, but my mom does it all the time and it is her recipe afterall). 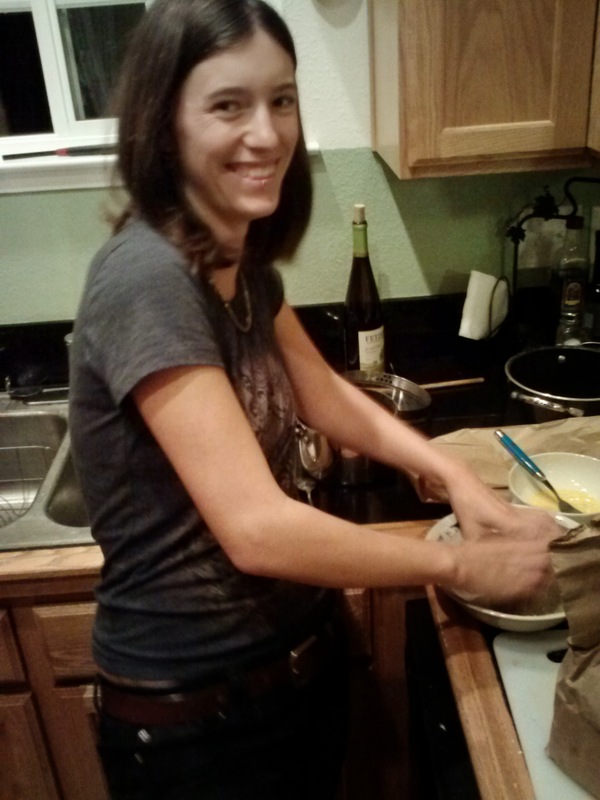 Categories: Cooking, Dessert, Grocery Stores, Musings, Recipes, Uncategorized, Vegetarian | Tags: bread, duck eggs, from scratch, Mendocino Organics, mom, pumpkin, recipe | Permalink. My dear friend Stephanie has been letting me crash at her place every so often- I gave up my rental house a month ago to save money… I have a big huge project in the works I need my pennies for! I’ve been staying at a beautiful friend’s farm, where another friend is helping me with my goats and letting me share the tiny, off-grid cabin. But I work late nights too, so having friends in town is excellent. 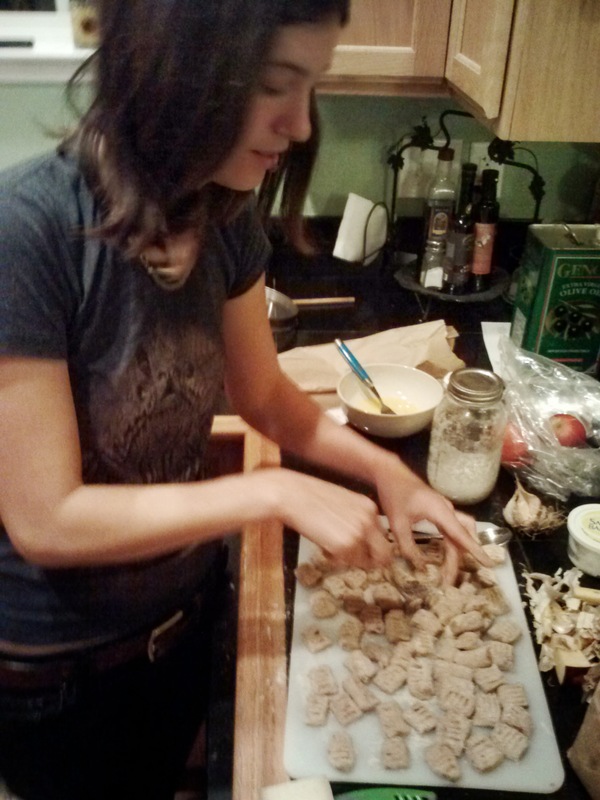 Last night, we made gnocchi, and I was shocked by how good it was. Every other time it’s come out too dense, but it was like little potato pillows. First, we boiled potatoes until they were soft, shocked them in cold water and slipped off their skins. Then we mixed in about one and a half beaten eggs, and some salt, and just barely enough of Doug’s flour to hold it together. 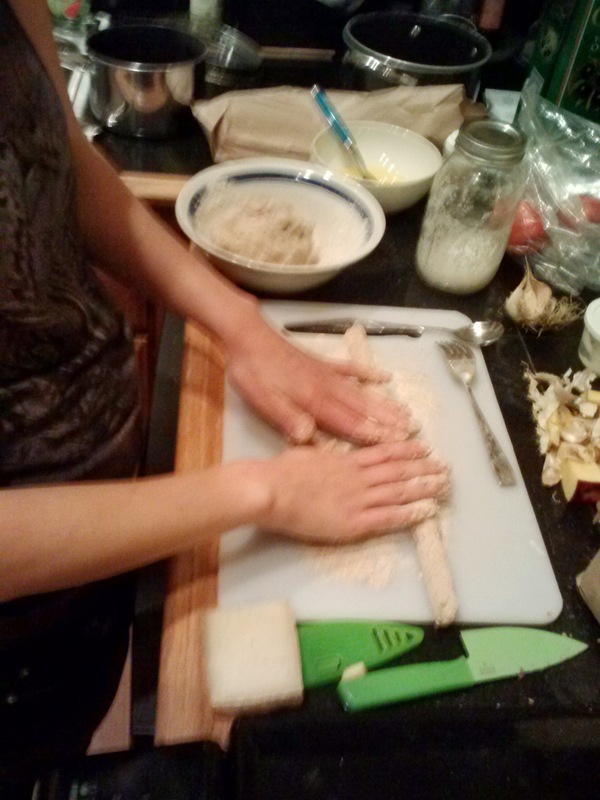 We rolled giant potato noodles. At this point I worried about how well it was holding together- that we’d activated the gluey starch in the potato, but it turned out great, so no worries. We cut the giant potato noodle into bite sized chunks, and marked them with a fork. 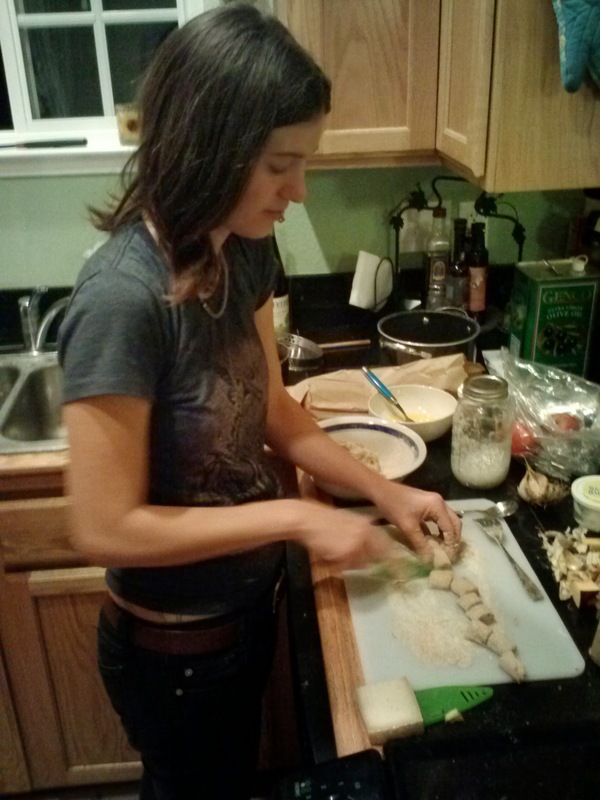 Much debate over proper technique ensued- an actual Italian was present who said the best thing to do is roll them off a fork, leaving a deep impression in the gnocchi. He ultimately decided that while that worked great for ricotta gnocchi, the potato gnocchi might fall apart if we rolled them that hard. So we stuck to squishing with the flat of the times. Once they were all squished, we dunked them in simmering water a handful at a time. When they’re done, they float to the surface of the pot and can be skimmed out with a big ladle and dunked immediately in cold water to shock them. 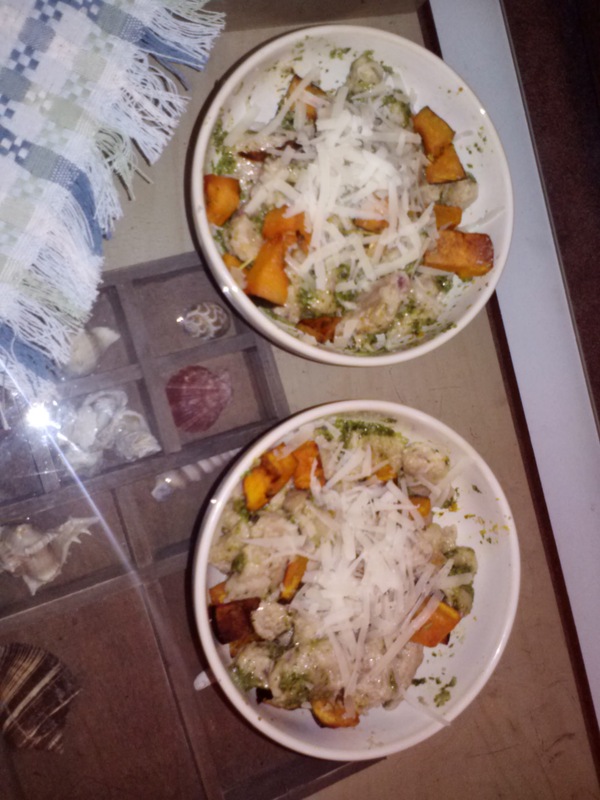 We then smothered them in an amazing all local herb sauce my friend Leu made, some Pennyroyal Boont’s Corners, and chunks of roasted winter squash. It was pretty amazing. Its so nice to have friends on cold nights. Categories: Cooking, Grocery Stores, Musings, Recipes, Vegetarian | Permalink. 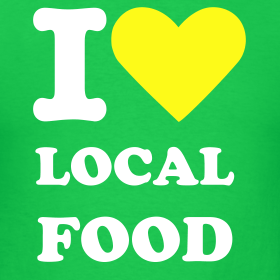 Tell Harvest Market that you love local food! Earlier this month, I was part of a groundbreaking meeting with the folks at Harvest Market regarding the opening of a new local produce section at their Fort Bragg store. This is a really ambitious effort to work with many small local farms and get locally grown produce on the shelves. This will make local food a lot more accessible throughout the year, every day of the week. Their goal is to launch soon, and I want them to know how much we – and you – love this plan. So, I created this little postcard for you to Print > Sign > Deliver. Change can be hard, and a little love always helps. Especially when it comes from customers who can’t wait to buy up all these local eats! So, click on the image, print it, write them a note in the empty space and sign your name, and drop it off in the comment box in the Fort Bragg or Mendocino stores. I will also have a stack of postcards at my table at the Mendocino Farmers’ Market tomorrow from 12 – 2 pm, so stop by and pick one up. 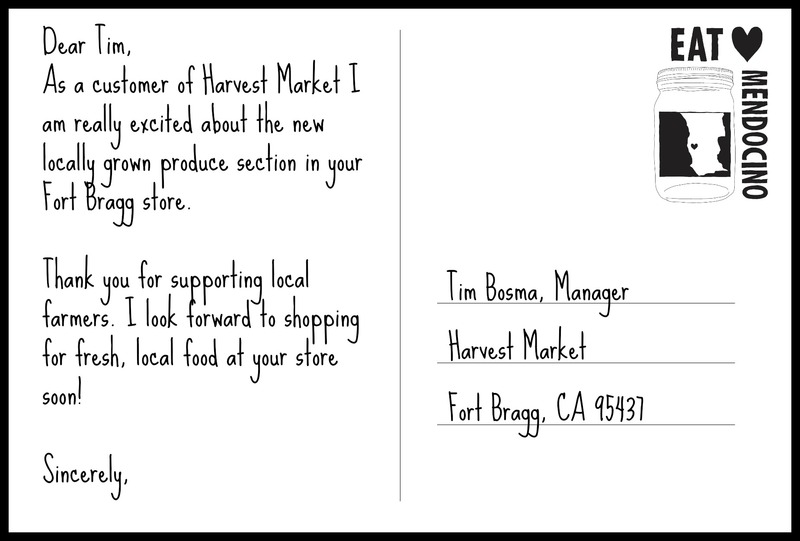 Categories: Farmers, Food Sourcing, Grocery Stores | Tags: Fort Bragg, Harvest Market, local food, mendocino, Tim Bosma | Permalink. Ukiah is currently #2 in the entire country in a national “I love my farmers market” campaign! So, if you love the Ukiah Farmers’ Market, please go to www.LoveMyFarmersMarket.org to make a pledge for the Ukiah market each week you will be shopping there through 9/9/13. By the way, if you haven’t visited the Ukiah market in a while, you’re missing out. 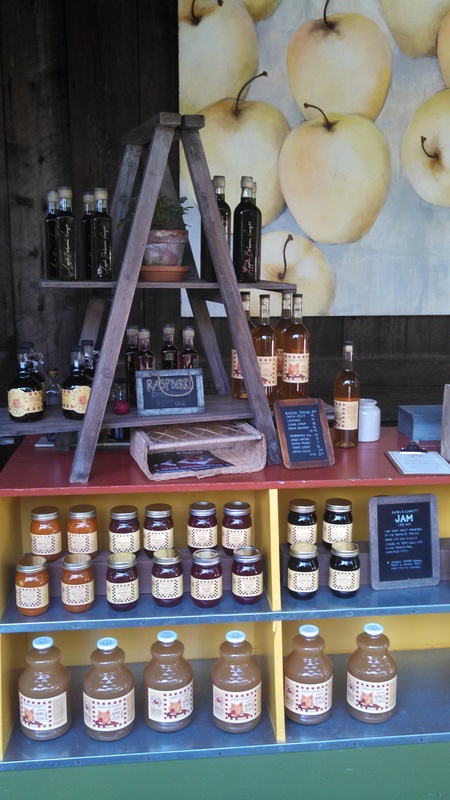 They are hogging all the sunshine over there, and have an incredible array of produce, meats, fresh crepes, jams and preserves, baked goods, body products, live music and the Ukiah Bicycle Kitchen, an on-site bike repair unit. It is a vibrant and wonderful event, which reminds me a lot of my hometown Saturday market in Chico. 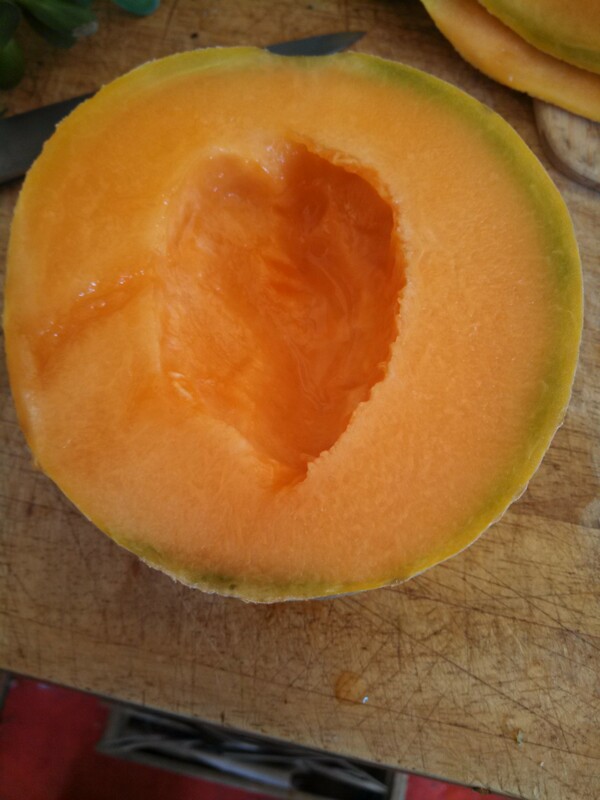 We enjoyed our own little slice of inland summer this afternoon on my deck, when Gowan sliced open a cantaloupe she picked up from Covelo Organics today at the Fort Bragg Farmers’ Market. The first melon of the season, and holy sweetness – it was everything a melon should be. The most incredible thing about this time of year is that the food comes to us every week from all over the County. It is a major contrast to the winter months where we had to travel inland often to get staple ingredients. Now, each week, the food express arrives and basically our groceries are delivered to us directly by the farmer. How amazing is that? 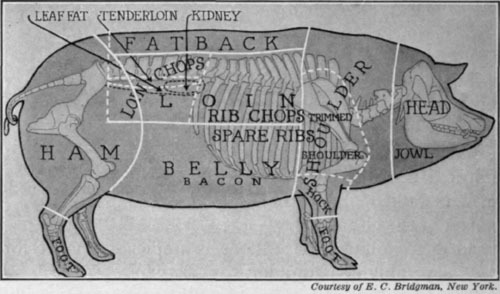 You don’t really appreciate this fully until you become entirely depending on the local foodshed. As Market Manager, I have noticed that most people don’t come to the farmers market with the same mindset that they bring to the grocery store. Most people are drawn to the shiny, colorful sweet things like carrots, berries, tomatoes, eggplant and of course the baked goods. People often overlook staple ingredients like potatoes, onions, garlic and even the leafy greens. That’s kind of the difference between visiting the market for subsistence vs. seasonal flare. I love the shiny sweet things like this cantaloupe as much as anyone. But, here’s a suggestion on how to experience the market more fully: this week, when you come visit me at the Mendocino Farmers’ Market on Friday, purchase a couple things that are on your shopping list that you don’t usually look for at the market – whether it be mustard greens, olive oil, spuds, onions or rhubarb. And, if you see something you don’t recognize (or have never successfully cooked), like kohlrabi, I encourage you to ask the farmer what to do with it – they are the experts. That’s the real magic of the market; your farmer grows your food, delivers it, and offers free culinary advice! Remember to bring your reusable bags, and visit the new Mendocino County Farmers’ Market website for lots of other tips, including advice on storing produce without plastic. 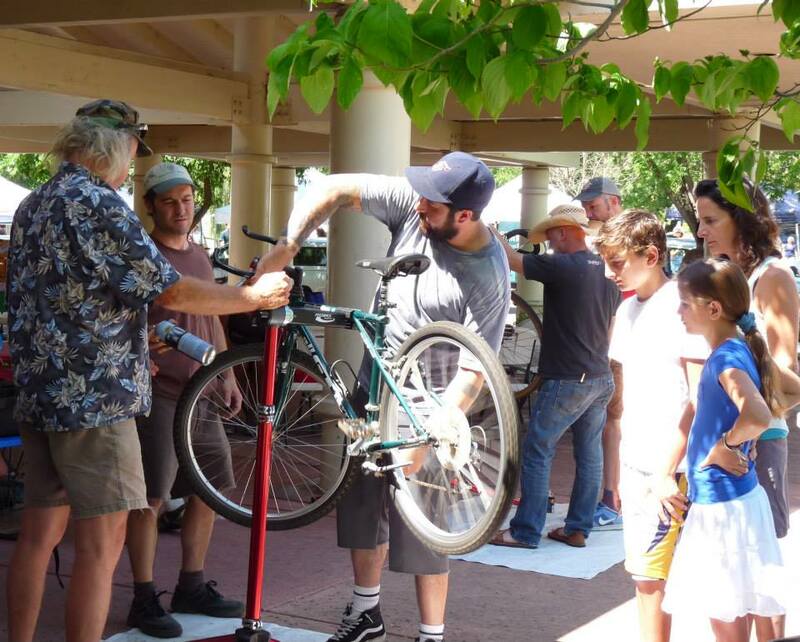 Categories: Farmers, Farmers' Market, Food Sourcing, Grocery Stores | Tags: bike repair, daily report, how to, i love my farmers market, MCFARM, Mendocino County Farmers Markets, ukiah bicycle kitchen, Ukiah Farmers' Market | Permalink. A locavore’s Saturday morning does not involve sleeping in. Mom and I were up early and on the road by 9 to do go on a scavenger hunt for groceries in the Anderson Valley. First stop was The Apple Farm in Philo. Pretty sure it’s the cutest farmstand of yummy in the world, with a beautiful pastoral backdrop of barn, apple orchards and the Navarro River nearby. Cuteness aside, Gowan and I had an apple cider vinegar emergency this week, and this is our supplier, so this was a serious visit. When I arrived there was only one bottle on the shelf, so I had to hunt someone down to open another case for us. Phew. Also picked up the first apples of this season! Next we went to Gowan’s Oak Tree farm and I got a bag of yellow peaches and some walnuts. 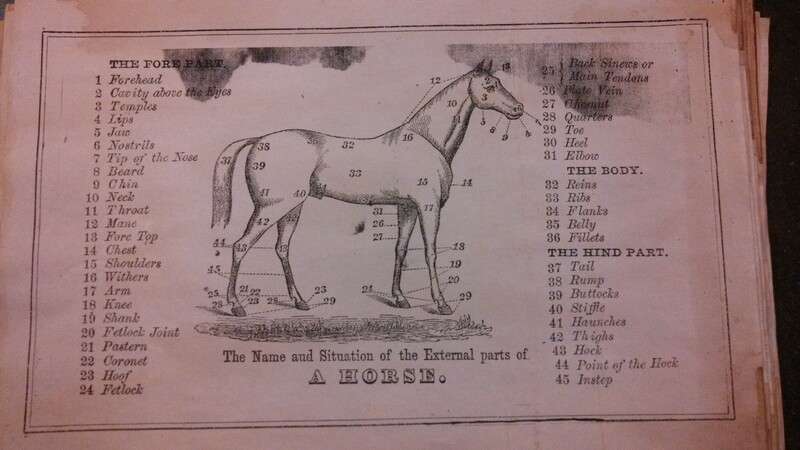 At the Farmhouse Mercantile in Downtown Boonville I discovered this useful vintage diagram. Must study up so I can impress Gowan with my horse knowledge as I fantasize about my future in the saddle. On the way home we stopped in at Balo Vineyards‘ tasting room and picked up a bottle of Pinot and some Pennyroyal Farms blue cheese. Next time, we’re staying to play bocce ball. All this and we made it home in time to enjoy a lovely afternoon in Mendocino. Not exactly your typical stop for groceries, but a lovely way to spend a warm summer morning and a wonderful occasion to put on a sun dress. Instead of rushing through the store aisles in my pajamas, trying not to get stuck in conversations with acquaintances, I look forward to these food forays. You feel differently when you’re going right to the source for your survival; you look forward to the smiles that await you and the brief moment to connect to other human beings who have become part of the ecosystem of your life in this great unending cycle of food and compost. Categories: Farmers' Market, Food Sourcing, Grocery Stores, Uncategorized | Tags: Anderson Valley, Balo Vineyards, Boonville, daily report, pennyroyal farm, Philo, shopping, The Apple Farm | Permalink. 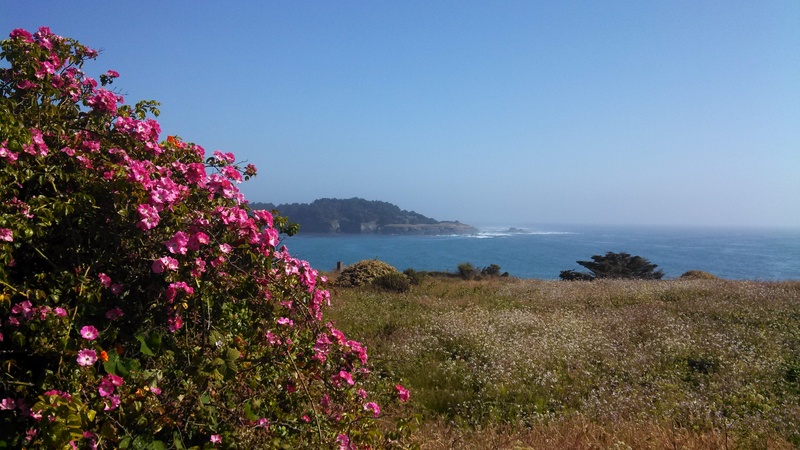 Welcome to the first installment of the “Eat Mendocino Daily Report,” and the first day of the second half of this yearlong locavore adventure. There is no better way to start a Monday than with a hearty breakfast. 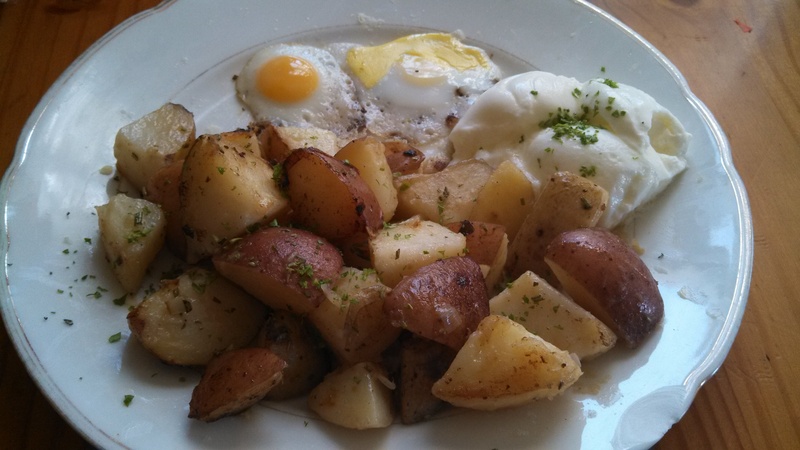 I cooked up some breakfast potatoes and two of Gowan’s quail eggs, served with homemade yogurt. Quail eggs are adorable and delicious, but it takes a lot of these to fill a girl up. Most homesteaders are experiencing egg abundance at this time of year and eating them with every meal. But, since I’m allergic to chicken eggs, and I have no alternative feathered fowl of my own, I have to import them. I have run out of duck eggs, and sadly most of Gowan’s quail were killed by a skunk or raccoon recently. One of the complications of the carless life is transporting a few key ingredients from A to B, over long windy roads. I do most of my shopping at the Farmers’ Markets every week, but there are some missing items. The egg beacon is shining, and there will be a balance of power on the morning breakfast plate soon. This afternoon I went to a monumental and exciting meeting with Harvest Market, our largest locally-owned grocer on the Mendocino Coast. The meeting had been initiated by owner Tom Honer who expressed an interest in getting more local produce on the shelves. This is basically a locavore’s dream come true. Today I sat down with these fantastic folks to talk about the nuts and bolts of making it happen. 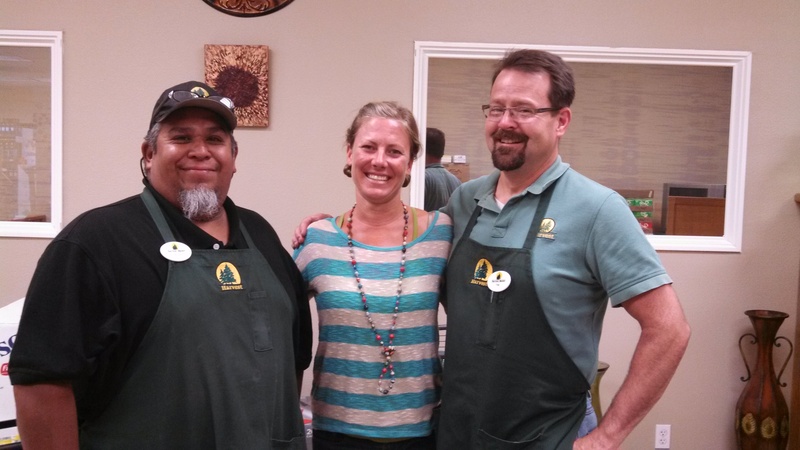 From left to right, Produce Buyer Jesse, Farm to Fork Coordinator Susan Lightfoot, and Manager Tim Bosma. How to differentiate local produce from the two main existing categories in the market: Organic vs. Conventional – creating a whole new concept for the shopper. Finding and sourcing products from local farms – we can certainly help with that since we have become food ninjas! This is a groundbreaking conversation that will establish a foundation for bringing a significant amount of locally-produced food on to the shelves at the grocery store. As a locavore, one of the greatest challenges is the lack of access to local food, and the outrageous inconvenience of having to buy things at many different locations, during very specific times of day. Plus, many Farmers’ Markets are seasonal and there are months where it is tremendously challenging to track down some local sustenance. Integrating the local food producers into our markets is an essential first step toward a local food economy that can work with our crazy lives. As Susan said, we can use this opportunity to challenge the consumer to think about “local first.” Instead of going to the store with a list of exactly what you want, this is a chance to see what’s available and start there. This is how we have built every meal since January 1st, and it is no small feat, but it is part of shifting our mindset from what we want to seeing what we already have. I am wildly excited about this burgeoning effort and highly optimistic that the right people are behind it to actually make it happen. This would be a great time to send love letters to Tom Honer and Tim Bosma and applaud their efforts. Of course, I promised that Gowan and I would be there waving our Eat Mendocino flag when they launch their new local food section, and bring all our fans with us. Categories: Farmers' Market, Grocery Stores, Uncategorized | Tags: breakfast, daily report, duck, eggs, Fort Bragg, Harvest Market, Local food sourcing, quail, Ukiah Natural Foods Cooperative, westside renaissance market | Permalink.